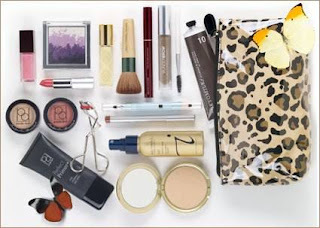 For the ladies that love make up and carry a little bag of makeup out to do touch ups during the day, what do you have in the make up bag? What are the make up items you can't do without? The ones you always make sure to leave the house with? Haa! Just say "i carry everything"
Make-ups are only fun wen u stay @home. Blotting paper,powder and lipstick.i must blot out oil from my face before applying powder. Can't do without lipstick, powder and lipgloss.... Alwz in my bag. Everything including brushes.my makeup bag is large. If i must leave it then it's in my car. Just within reach.